1) – Frenzy 6+. Will not use missile weapons. 2) – Suffers -1 To Hit in combat, gains + 1 Strength. 5) – Stupidity. Make an Initiative Test for the Goblin each Monster’s Phase (1D6 + Initiative). If the result is 7 or more, the Goblin receives +1 Strength for the turn. If the result is 6 or less (a 1 always fails) then the Goblin may do nothing this turn as the ‘shrooms addle his mind. Pet Squig – The Goblin has a pet Cave Squig. This is placed in addition to the other Monsters in the room, and adjacent to the Goblin if possible. The Squig has the same rules as a Trained Cave Squig, but also Gains the Guard ability (See the Roleplay book for details). As long as the Goblin is alive, the Squig is considered to be herded. Bone Talisman – The Goblin has a neclace adorned with the knuckle-bones of the Warriors it has slain. 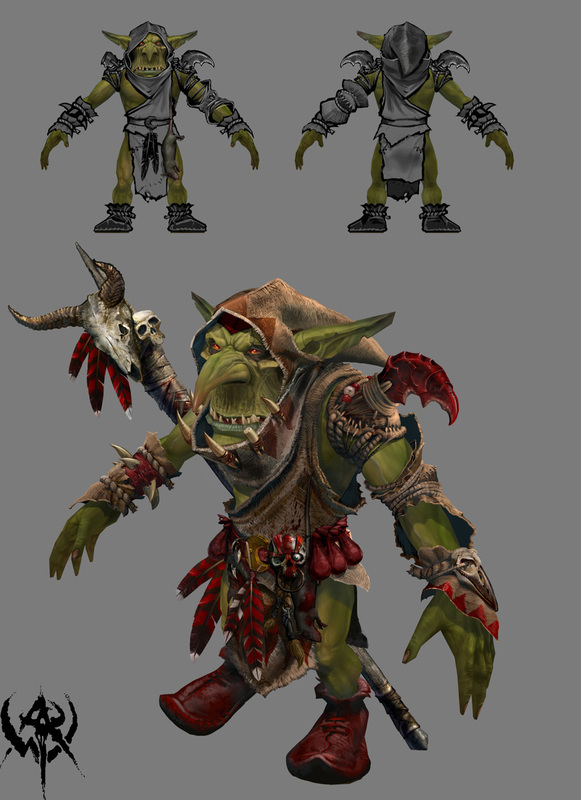 The Goblin is exceptionally cunning, and Night Goblins with a lower Ambush ability that are placed at the same time as the Boss automatically Ambush if the Goblin does. If unaccompanied, then then add 1 to the Ambush roll of the Goblin. Ring of Night – The Goblin blends in with the shadows that it inhabits. As long as the Goblin is not in base contact with a light source like the Lantern, Warriors suffer -1 To Hit when attacking it. Toof Necklace – The Goblin has a necklace made from the teeth of Wild Cave Squigs and other monsters he has bested in combat. He gains +1S and +1 WS to represent his superior ability. ‘Ummie ‘Eads – The Goblin has cut the heads off the last brave adventurers to enter his domain, and a Goblin Shaman has placed a powerful curse on them so that they radiate terrible malevolence. The Goblin causes Fear (The Dungeon Level + 1). Poisoned Arrows – If the Goblin has a missile weapon, then it has the Poison ability whilst using it. In addition, the arrows ignore 1 point of armour. Squig Prodda – Counts as a Squig Herder for the purpose of controlling Trained Cave Squigs. Fight in Ranks. +D6 damage on a natural 6 To Hit. Sword of Stabbin’ – Re-roll failed misses once each. Helm of Gunbad – Missile attacks simply miss the wearer. Magic missile weapons can hit, but the wearer gains Ignore Blow 5+ against them. Crooked Moon Shield – The moon depicted on the shield has a twisted face that gibbers and whispers to the bearer of this shield, granting him Dodge 6+.